Everywhere I look, spring seems to be here early. I swear there were cherry blossoms the first week of February. This is definitely a sign that spring fashion should come early, too. And thanks to Steve from Rainebrooke Bags, I have a gorgeous bag to start the season off with flair: the Tuscany laptop tote by Nunzia Design. A black leather tote with a touch of pink happiness, the Tuscany tote is exactly what I need when I find myself wearing too much black. The tote gives me something less austere as the weather begins to warm: something professional that offers a bit of bloom. The Tuscany tote is punctuated with clean, pink lines at the exterior seams and soft, light pink suede at the top, zippered opening. And inside? 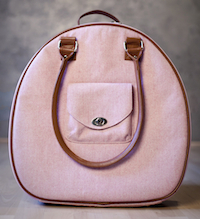 Light pink lining! The Tuscany tote has several pockets to keep me organized. The exterior has an easy access pocket for slipping in my lipgloss and my glasses. It's just big enough for everything to be at my fingertips. The interior of the Tuscany tote has several pockets. One side has two large pockets. Ahem, pockets large enough to handle my overstuffed wallet. The other side has spots for business cards, pockets for my iPhone, keys, tissues, and a long, zippered mesh pocket for whatever technical gadgetry I desire. Unlike other bags on the market, Tuscany's padded laptop sleeve is an insert and completely removable from the tote. 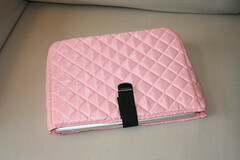 The sleeve fits a laptop with up to 15.4&quot; screen and is made of light pink quilted fabric. My MacBook Pro easily slides inside and is secured with a velcro & elastic closure. A thicker PC would definitely fit, too. I then tucked it away into the large primary storage area of the bag with room to spare. But wait! There's more! The Tuscany tote comes with a quilted make-up bag, which I plan on using for my AC adapter and cords. The kidney-shaped bag is large enough to hold even the bulkiest power adapter. See detailed photos of the Tuscany over on my Flickr account. If you've read my other reviews, then you know that I like to test a bag for comfort. The Tuscany's straps allow the bag to rest partially on my hip, helping to distribute the weight of my laptop so that it's not just my shoulder carrying the load. Fantastic. The handles, which are well-secured to the bag, are rounded and are also comfortable to carry in my hand or on my shoulder. In sum, the Tuscany tote can carry and organize all I need for a day of meetings and lets me flirt with colour. If the pink accent isn't your cup of tea, the sleek Tuscany also comes in black with three other accent colours: olive, red and tan. 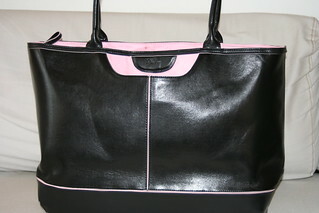 The Tuscany laptop tote by Nunzia Design will put spring in your step and is available for $119 at Rainebrooke.com. Does your laptop bag shout SPRING?! This one does! 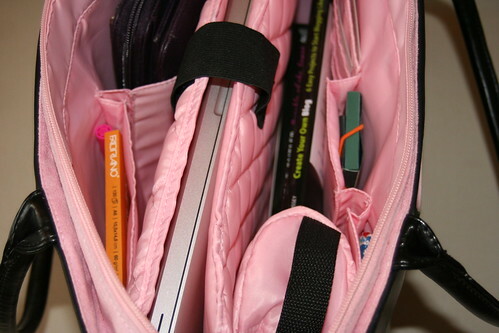 Geek Girls Love Bags that Hold Their Laptop AND Tablet! Welcome to Funchico.com. "funchico" is short-hand for "Funky, Chic and Cool". Mainly I write about funchico Laptop Bags and Laptop Sleeves. But we also write about Cool Knitting Bags, great Laptop Backpacks and Cool Laptop Bags for Men. Oh, and we're reviewing Netbook Sleeves and Cases too! iPad Cases have been added as well! And sometimes, there is other stuff that is funchico that I will mention here :) I hope you enjoy! Please check out the really cool vintage-style laptop bag that I designed - the Funchico Laptop Case!